Privacy Indicator is an Ubuntu AppIndicator especially created to control some privacy aspects of Unity. show real name on the Unity panel. After a recent update, the indicator can also clear the Zeitgeist log and recent files (from the new Nautilus 3.6 sidebar, etc.). That's all the Privacy Indicator does for now but if you have an idea for some other privacy-related settings, submit a bug report on Launchpad. 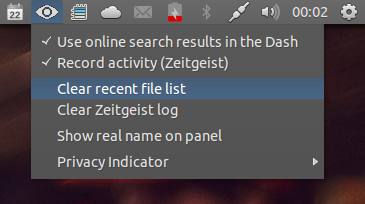 These settings are already available either via GNOME Control Center > Privacy (for enabling / disabling online search results or disabling Zeitgeist) or Dconf-editor, but using Privacy Indicator, you can quickly enable or disable these features which can be useful in various cases, for example if you often need to disable Zeitgeist, etc. If you don't want to add the PPA (but without adding the PPA, you won't get automatic updates), you can also download the Privacy Indicator deb from HERE (look at the bottom of the page).